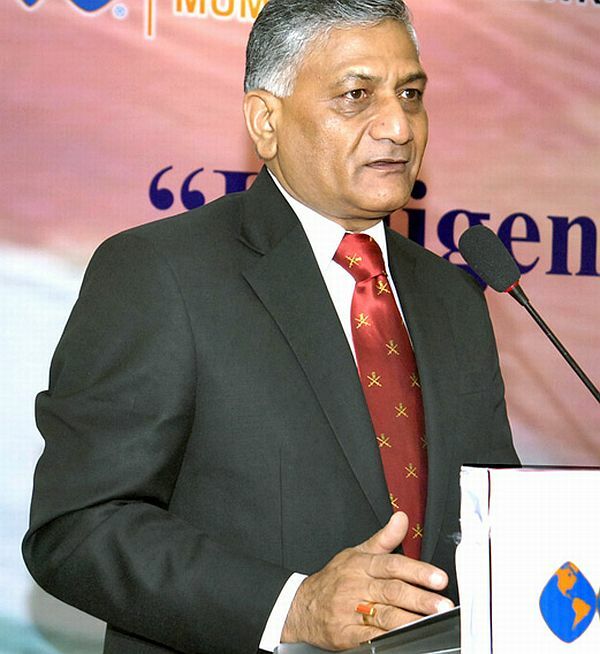 Rediff.com » News » General V K Singh marching towards the BJP? General V K Singh marching towards the BJP? Will former army chief General Vijay Kumar Singh pledge his allegiance to the Bharatiya Janata Party in the 2014 Lok Sabha election? A likely indicator came when the retired general spoke at an event hosted by the Overseas Friends of Bharatiya Janata Party in New Jersey last Friday. The OFBJP is the BJP's associate in the United States. General Singh -- who had an uneasy relationship with the UPA government during his tenure as army chief -- has been spoken of as a BJP-supported candidate against a member of the First Family, likely Congress President Sonia Gandhi if she indeed contests the next general election from Rae Bareli. But Sonia could retire from electoral politics next year, and the general may well confront the formidable Priyanka Vadra in the Pehela Parivar's Lok Sabha bastion. 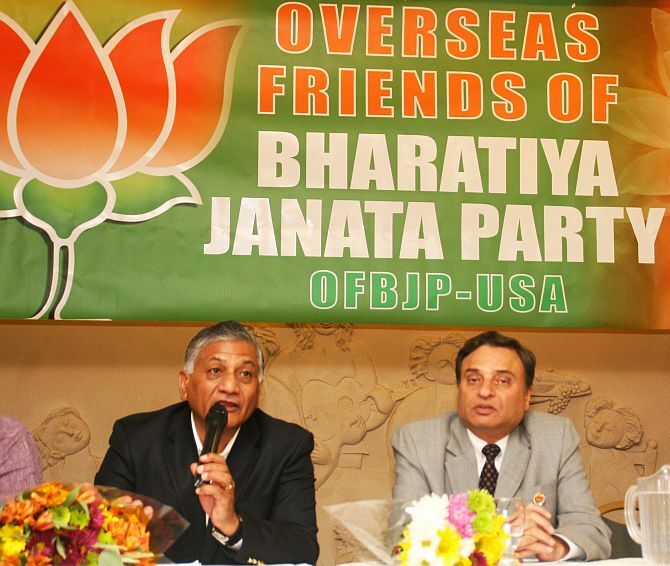 Image: General V K Singh addresses members of the Overseas Friends of Bharatiya Janata Party in New Jersey. After he retired from the army, General Singh has joined the ranks of India's crusaders against corruption -- both he and Kisan Baburao 'Anna' Hazare were the star attractions at the India Day parade in New York city on August 18. 'Three qualities are needed in candidates contesting elections -- no criminal background, capability and love for the nation,' the general said. 'We all have a bigger role to play to bring about this change and undo the bad that has happened after Independence,' General Singh added. Later, responding to a question from the audience, the general dropped a possible hint of his intentions. Sunny Deol all set for politics? Dilli Gupshup: What was Modi thinking?